I used to dread getting older, and I would keep my age a secret. My attitude about getting older changed after my 6th year of teaching. That year I had a student named Colton in my class. He was energetic, friendly, and always willing to help. He loved to tell me what he had done over the weekend or the details from his football games. My 29th birthday was just a little over a month after Colton died. Up until that point, I was lamenting the fact that I only had one more year in my 20’s! But Colton’s short life changed the way I now view birthdays. I feel like each time I cringed at the thought of getting older, I also minimized the value of my life, Colton’s life, and the lives of so many others that don’t get to turn another year older. Each year of my life represents another year that I was given to enjoy, so I embrace the fact that I have been given the gift of life! I celebrate each year rather than saying, “It’s just another day”. Birthdays are much more than just another day. They are a day to celebrate, to embrace, to give thanks, and to look forward. So I don’t keep my age a secret anymore, and this Friday I turn 33. I am celebrating how much I have grown as a mother this past year. I am embracing my role as a stay at home mom and trying to do my very best while giving myself grace when I fall short. I am thankful for my husband who has faithfully supported our family this past year. I’m thankful for my son who brings much joy into our lives. I look forward to deepening my relationships this coming year. I want to spend more time with the Lord and with my family and friends. How do you view birthdays? If they have been a source of dread in the past, I urge you to think of them as a gift this coming year. As a child, I loved getting older, I truly did, all I wanted was another birthday to come by, it meant more presents (ah the mindset of a child), and then I lost my grandpa at 12. Suddenly each birthday wasn't as important was it once was, because each birthday the came and went was one more without my grandpa. So like you it took a death to change how I felt about my age. After that I dreaded my birthdays, and was very apathetic about it. Now, my thoughts have changed once again, I met Kyle, we had our daughter, Sophie, and I've gotten a year and a half of being a mother, my thoughts on my age have changed. I see each year as another celebration that I have with Sophie and Kyle. It is amazing how much the death of a loved one can change our perspective on life. A couple of my grandparents died when I was around 12-13 too. Being a wife and mother is such a great thing to celebrate! I hear people say they don't like getting older either, and I think… well what's the alternative? Just like you, I think life is to be valued, cherished and enjoyed at whatever age you are. I'm the same with my kids. I used to think that having babies was the best until I had toddlers and could have a conversation with my kids… then I thought having toddlers was the best, until they got to be school age and I didn't have to constantly worry that they were going to choke or wander off or whatever. Then I liked that best… until they were in high school, and we could go have lunch together or enjoy watching a movie in the evening… then I liked that best… now that most of them are out of school, I think wow, my kids are my friends and I can enjoy an adult relationship with them and this is best. you get the point. I'm just saying that we should hold yesterday as a beautiful memory, look forward to the promise of tomorrow all the while celebrating NOW. It sounds like you have a great relationship with your kids. My son is only 14 months old, but I have really enjoyed each milestone. I love the last sentence that you wrote! Now that I am a mom, I'm trying more than ever to celebrate the "now". One of the best pieces of mom advise that I got was to enjoy whatever stage my son was in and not wish for him to be younger or older. Yes, time does go by so fast. I think as a mom it seems to go by faster because we see how fast our kids are growing up! Being a mom has really challenged me to appreciate each day. Thank you for stopping by from the Shine Blog Hop. That link up is one of my favorites to join! It's amazing what a change of perspective can do. What a tragic loss of your young sweet student. I'm so sorry you want through that, but you have made the most of your grief by choosing to cherish life. Happy birthday week! Thank you, Candace! Yes, it is amazing how much we can learn and grow from tragedies no matter how difficult the situation may be. Great perspective, Julie! I have felt the same way and wished I had accomplished more. But the future is full of possibilities! Thanks for visiting from the Shine Blog Hop. It's a great link up! Wow! Thank you for putting that into perspective! I feel old and I am only 25. I am so blessed to have already enjoyed 25 years of life and each year is another blessing. Thank you for that! I remember feeling old at 18. LOL I guess it is all perspective. You are right each year is a blessing! Happy birthday, Emily! And welcome to 33…I still have a couple months left at this age myself. I love my 30s because it's the decade when I became a mother at last. That is worth celebrating with every birthday! Thank you, Kristen! Yes, we are so blessed to be mothers even though it took a little longer. I love my 30's for that reason too! What a heartbreaking story Emily. 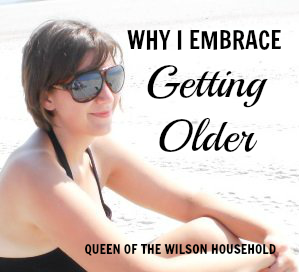 You are so right about embracing your age. We’ve gotten to live another day, enjoy another week, and remember another year. I’m 55 this year and I remember when I was heartbroken I turned 20! Didn’t seem like it mattered too much after that.